What about a Galois Prize for young European mathematicians ? I have noticed, and also have been told, that there are, in the USA, several great programs designed to mentor students interested by doing some research in mathematics, both high-schoolers (see the MIT programs like RSI and PRIMES) and undergraduates (see the list of REU at dozens of universities). Some particularly talented students sometimes come up with great ideas and papers, and win a prize: there are the Siemens and Intel prize for high-schoolers, and the Frank and Brennie Morgan Prize of the AMS for undergraduates since 1996. For example the 2012 winner of that latter prize, 21 year old John Pardon (now a PhD student at Stanford), solved a 1983 conjecture of Gromov (a problem he found in a list online while in high school, and solved after a couple years of work) and his paper got published in Annals of Math, no less. Earlier winners are equally talented (Soundararajan, Bhargava, Lurie, Fox, Kane…), and I have noticed that most have attended one of the programs mentionned above. So indeed, thanks to those programs, there is a regular influx of such talented undergraduates with early research accomplishments. And in fact, this US trend to get youngsters work on research problems with a mentor even before undertaking a PhD is gathering momentum. For example, an earlier winner of the Morgan Prize, Scott Duke Kominers (who won for works on number theory, and is now an economics professor at Chicago) has just launched with some coworkers a book and a website aimed at providing tips and impetus to such high-schoolers. Let’s now look at Europe. Unless mistaken, there’s not much happening yet. A summer school for youngsters will take place for the second time this summer: a great opportunity to learn, but perhaps not quite designed as a mentoring program, and also it is held in english when most european students don’t have good enough fluency to express themselves, let alone think, in that language. And finally, even if some European student came up with a good paper, there is currently no prize to recognize her/his work and serve as a further incentive for other students. That’s why I would think both a prize, and several mentoring programs with a good mix of english and the student’s tongue are commendable. Since the name of Galois is not associated with a prize yet, and since it does embody quite well the idea of a talented young european mathematician, that’s a good option I would think. A few weeks ago, the 2012 crop of the 10 winners of the Intel Science Talent Search have been announced. As usual, these are great projects in a wide variety of fields (cancer research, robotics, geophysics, ecology, …). Several math projects were in there too: 18 year old David Ding came 4th with his work on Infinitesimal Cherednik algebras of (done during a PRIMES program at MIT— which seems to be a fantastic setting indeed for insterested high-schoolers — under the supervision of Sasha Tsymbaliuk). And 17 year old Anirudh Prabhu came 7th for his first non-trivial analytic lower bound of odd perfect numbers (his arxiv papers are here). Apparently he has been taking accelerated courses for a number of years, and did his research on his own without a mentor. That’s impressive in both cases, and shows that there is not one single recipe for success. 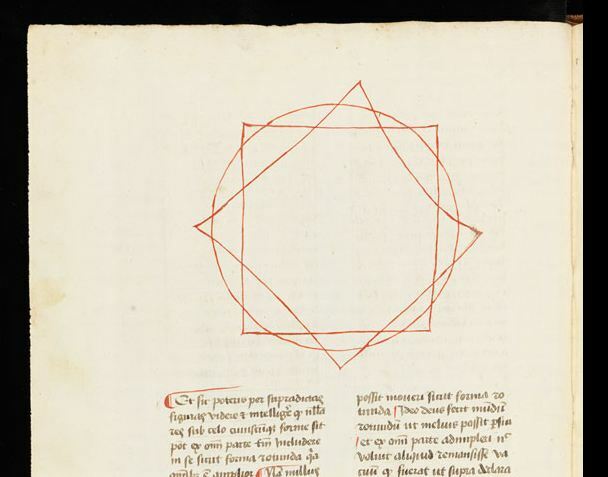 Exerpt of a 1458 copy of De Figura seu imagine mundi by Louis de Langle who first worked out the shapes of the 2-dim unit spheres for .